Though the bustle of downtown Nassau is just a short drive from the One & Only Ocean Club on Paradise Island, it’s a tall order to leave the resort grounds. One of the first Bahamian developments, the historic property dates back to 1939, when Swedish tycoon Alex Wenner-Gren staked his private residence on what was then called Hog Island. He eventually sold his idyllic paradise to Atlantic & Pacific Tea Company heir George Huntington Hartford II, who developed the property into a resort and lassoed the 1960s jet set. As such, there’s reason the James Bond film Casino Royale was filmed here. Hugged by an impeccably manicured resort lawn sprinkled with come-hither hammocks, seductive island living is underscored by plantation-inspired sophistication. The aptly named and often touted Hartford Wing recently debuted an extensive makeover. 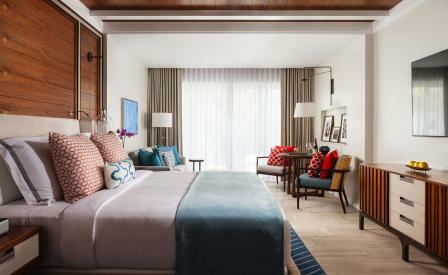 Each of its 52 rooms gained 110 feet, and a new colour palette (cerulean blues, aquamarine and Bahamian-sand white) celebrates lively Bahamian authenticity. Helmed by London-based design consultants HKS Architects and New York firm Jeffrey Beers International, the renovation includes new appointments, fabrics, and modern art, while bathrooms - now with new modern baths and separate rain showers - are anchored in blue de savoie marble . The Hartford Courtyard has also been transformed, with work by artist Jane Waterous prominently on display. A new beachfront infinity pool makes its splash, too, with the adjacent Ocean Pool Grill. Take an outdoor sunrise yoga class that overlooks the sea, or walk the property’s terraced Versaille-inspired garden. After sun-kissed afternoons on the horseshoe-shaped beach or après spa, dine at the newly expanded Dune restaurant and Dune Deck, with haute Bahamian cuisine crafted by Michelin-starred Chef Jean-Georges Vongerichten.